If you have tried to find a good used Corvair steering box, you know that the chances of finding a good one are slim to none. Don't bother! These brand new Corvair steering boxes have already been reversed. 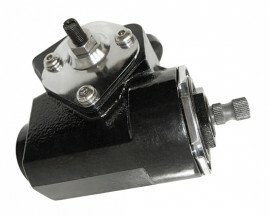 Designed for use on traditional steering cars and T-buckets, these boxes are constructed of modern high strength steel and needle bearings to ensure durability, which original boxes just can't offer.